For Christians the resurrection is of supreme significance, but can we articulate why? I’m not so sure. Our first instinct may be to say that Jesus’ resurrection proves his divinity, but I think it in fact proves God’s divinity, which is rather redundant. If you think about it, a god being raised from the dead is actually expected; it’s a human that needs special intervention once they are dead. Raising someone from the dead proves divinity; being raised from the dead says nothing in that regard. Fundamental to Christian belief is that we are all going to be resurrected someday, but that doesn’t mean that any of us are divine. If God is God, he can raise anybody he wants from the dead. That he raised Jesus says something about Jesus, but not necessarily that he is part of the Godhead. I guess in a sense you could say that the resurrection proves Jesus’ humanity, but that doesn’t really sound like we’re saying much. Why go through the trouble of resurrection to prove that he was human when much more mundane things like eating and sleeping, bleeding and dying could do that? He was resurrected because of his obedience, which is not just another way of saying that he lived a sinless life. That just means he avoided doing some bad stuff. Obedience is not avoiding anything, it’s taking something on. Obedience is active, it’s assertive, it’s proactive. To understand Jesus’ obedience we need to look at what he did that last week. If Jesus had gathered an army and then gone into Jerusalem, he would have been disobedient. If Jesus had avoided confronting the Jewish and Roman leaders because he didn’t have an army, he would have been disobedient. It was because he stood against the forces of injustice and oppression but was unwilling to use their means to accomplish his ends, i.e. 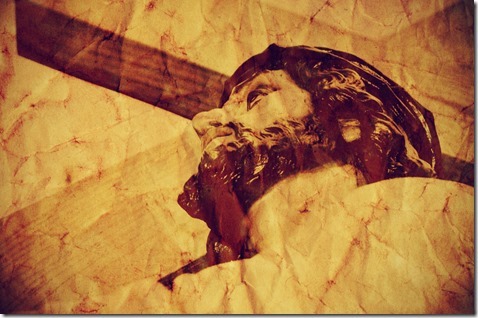 he refused to kill but rather allowed himself to be killed on a cross—this is why he was said to be obedient. And this is why God raised him from the dead. The resurrection is the vindication of a particular way of responding to the forces of evil, the oppressors who bring death to the world, and the agents of violent injustice who use brute force to accomplish their ends. The first person truly resurrected didn’t just die, he died army-less on a cross as the solution to the world’s way of ongoing death and violence. Resurrection is for those who thus pick up their crosses and follow Jesus.